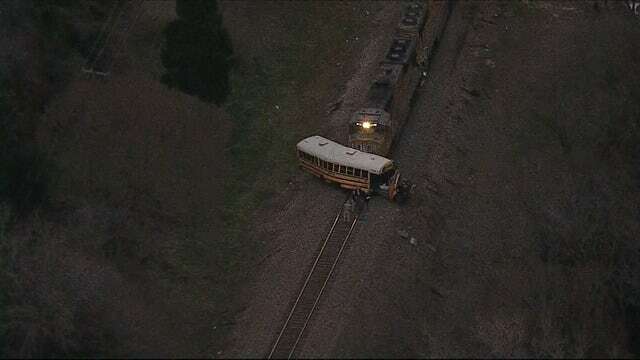 A Union Pacific took a school bus on Friday in East Texas, killed a middle school student and injured the bus driver and another student, the authorities said. The accident happened around kl. when the bus from the local school district tried to cross traces in Athens, a city of 12,700 inhabitants about 70 miles southeast of Dallas, reported Tyler Morning Telegraph. He said a 13-year-old male student was killed and the 78-year-old bus driver was in stable condition after being hospitalized for unspecified injuries, said Hill. A 9-year-old girl attending the Central Athens Elementary School was injured and flown to a hospital in Dallas, where she was in critical but stable condition. No other student was on the bus, according to the school district. The name of the two students and the bus driver was not immediately released. "My heart is broken for the families," said the school's superintendent Blake Stiles. Both students have to be cut out of the wreck, Fox 4 Dallas reported. The authorities still established the cause of the collision.